Who says kids have all the fun? These 21-and-older bars incorporate great drinks and plenty of games. Coney Island–themed dive bar Shorty’s (2222 Second Ave; shortydog.com) has been a Belltown standard for more than 20 years. The flashing lights and 8-bit sound effects from dozens of arcade games and pinball tables give this retro-style hangout a carnival-like atmosphere. Pair your beer or slushy cocktail with one of Shorty’s signature hot dogs. SPiN (*1511 Sixth Ave; seattle.wearespin.com) combines table tennis with an urban club vibe inside a cavernous downtown spot that boasts 12 Ping-Pong tables, a menu of craft cocktails, and upscale bar food (think pancetta and chèvre flatbreads or smoked duck leg and foie gras sliders). Masters of mini golf should plan to swing by Flatstick Pub (*multiple locations; flatstickpub.com) in Pioneer Square and South Lake Union. 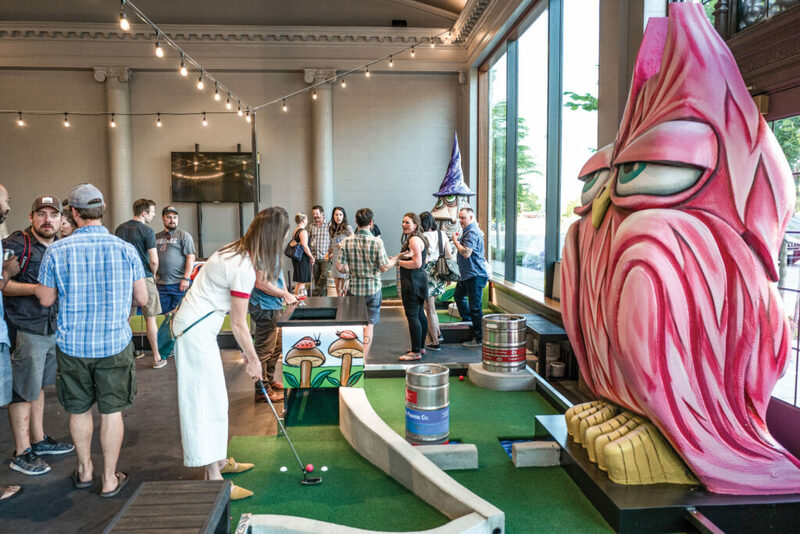 Each venue features a bevy of local beers on tap, tasty bar food, a custom-designed nine-hole indoor course, and Duffleboard, a Flatstick invention that mixes elements of shuffleboard and mini golf. Bocce is the name of the game at Capitol Hill’s Rhein Haus (*912 12th Ave; rheinhausseattle.com), a Bavarian-themed bar where you can wash down schnitzel sliders, house-made brats, and giant pretzels with European and Northwest beers. Test your bocce skills on one of the five indoor courts. There’s an additional court—and a biergarten with a fire pit—outside. A few blocks away, Garage Billiards and Bowl (*1130 Broadway, garagebilliards.com) packs 20 bowling lanes and more than two dozen pool tables into an airy, industrial space with exposed brick walls, comfy booths, and a diner-esque restaurant. Pull up a chair and order from their menu of shareable plates and hearty burgers before challenging your friends to a game of tenpin.